An overhead door is a complicated machine; it consists of dozens of different components that all have to work perfectly together. Over time, as parts begin to wear out, there are plenty of different issues that can start to develop, from broken rollers and bent tracks to worn-out springs. Our technicians have the experience to quickly identify any problem, and the skills required to provide a fast and effective solution. 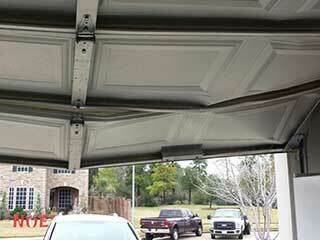 The most complex part of any garage door system is the opener. This unit is directly connected to many different electric and mechanical systems, including the safety sensors, the drive and the trolley, and it must function perfectly in order for it to open and close the door correctly. Due to its complexity, it can be hard to pinpoint faults in the opener. However, our technicians have many years of experience working on all types of this device, including chain-drive and belt-drive units, and we can fix all the different issues that they can experience. If your door starts reversing and wouldn't close, or if it won't open at all, you can count on us to quickly resolve the problem. Your garage door tracks can be damaged more easily than you might think, and even a little bending can prevent the rollers from moving smoothly. Non one wants to deal with a situation where the door got off track, which is why you need to have our technicians come and help you at the first sign of trouble. We can straighten the tracks and even replace them entirely if their damage is too severe. Without a good set of rollers, your door won’t be able to move; this can result in more wear and tear, and a significant increase in noise while the door moves. Replacing the rollers can be a little tricky, as they must be able to move effortlessly along the tracks, otherwise you could be dealing with some problems. For that reason, you need to let our experts replace them when they wear out. We'll make sure that your door has no problem opening and closing. Whatever problem you’re experiencing, our professional technicians at Garage Door Repair Casselberry are ready to provide you with an effective solution for it. Give us a call today and we'll make sure that your system returns to its normal operation in no time.